Have you ever looked at someone else and thought they had the perfect life? Maybe you’re sick…and they’re not. Or they have lots of money to buy cool toys…and you don’t. Or maybe they seem to be surrounded by friends…and you only have your pet bearded dragon to moan about the day’s drawbacks with at the end of the day. No one is exempt from trials, afflictions and burdens in this life. We were sent here by a loving Heavenly Father to grow and learn. We can’t do that by taking the easy road that gains no elevation. Most trials are easy to identify. Sickness. Pain. Addiction. Business failures. Divorce. Family troubles. Death. Infertility…and lots of other challenges I won’t terrify you by listing. You are either facing adversity, or you’re enjoying a nice breather before the next dose of affliction whacks you onto your backside. There is no in-between. We have the choice. We can groan and moan so everyone knows we’re suffering…or we can pray for help and mask our pain with a smile. Adding service into the mix can even lift our heavy hearts so that the smile becomes real. Some of the happiest people I’ve known have dealt with the most horrendous trials (Multiple Sclerosis, chronic pain, loss of close family members, cancer). They chose to wear a smile and lift others around them in whatever capacity they could. One friend who was in the advanced stages of MS literally could only smile and offer me friendly conversation. When I partook of her gifts, I always left feeling as though I had interacted with an angel and been lifted to heavenly heights. Look at the Book of Mormon for examples of this. When the Nephites were blessed with prosperity and peace, they relaxed spiritually and fell into the pride cycle. Mormon described it perfectly in the book of Helaman. The very things that blessed their lives became obstacles that distanced them from God. Hard things stretch us and enable us to grow.They also have the potential to help us become intimate with God. My happy friend became more compassionate, patient and loving because of what she endured for 30 years. The Lord didn’t take her disease away; it grew worse until she couldn’t move any part of her body and had to be cared for by others. Yet, I never met anyone who exuded such pure peace and joy. 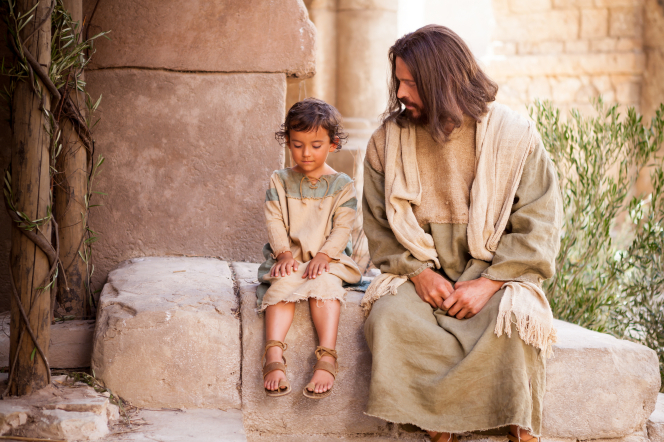 The Nephites’ wars and droughts humbled them so that they turned to God and forsook their own wills for His. This led to peace and prosperity. So, how do we enjoy blessings without becoming lazy and prideful? In my opinion, the key is to keep the Savior as our number one priority. If we stay close to Him, we will choose the right path…the one leading to peace and joy (even in times of affliction). We pray, search the scriptures and words of modern prophets, and seek to develop a relationship with Jesus Christ. He wants us to become like Him and has atoned for us so that we may do just that. In blessings or trials, we need to remember God. Trials have the power to forcibly humble us and cause us to turn to Him. When all seems dark and dreary, drop to your knees and thank God for His love. Show your faith by submitting to His will, and ask Him to take you by the hand and carry you through the trial and learn from it. Everyone can be grateful for the gift of life, and for a new day tomorrow. Instead of being a consumer of happiness, let us become generators of joy. Service is the key. It’s hard to be negative when we help others. These three actions–learning of Christ, Being Grateful, and Serving can help us keep the right focus. Are we blessed or burdened? If we truly love Christ, whatever life throws at us will always be seen as a Blessing…even if it is hard, painful, or plain not fun.It isn’t that the nature of the trial changed…just our perspective through Christ.